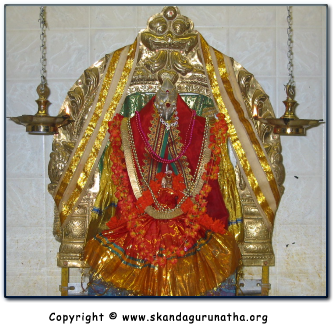 Today was an auspicious day for God Skanda called Aadhi-Thiru-Karthigai (or Kiruthigai in Tamil). To show my love for Murugan, I observed a strict fast. By His will and Grace, I went through the entire day without eating anything nor drinking (including water). In fact, I completely forgot about my appetite as I was busy with my work (I currently work as a business applications developer) and was at the same time contemplating on Sri Skanda's feet, whenever I had a spare moment during the day. At the end of the day, I quickly rushed home to take a bath. I applied vibhuthi all over my body, got dressed in a veshti and proceeded to the temple. When I arrived, the priest requested me to help him with the abishekam and puja. My mother decided to have an abishekam today out of love for Lord Skanda. As I was preparing the materials for abishekam and puja, I noticed my mother cooking food to give to Murugan and then to all the devotees who would come that evening. I advised my mother, "Amma, please make sure you make enough uppumaa [a type of prasadam made from rava flour, vegetables, onions, etc.] for all of Murugan's Adiyaarkals (devotees)." My mother replied, "Don't worry, I will make plenty." The abishekam was beautiful as I expected. What isn't beautiful about witnessing our loving Sri Skanda being spoiled with panchamritam (fruits), sweets, milk, and other extragavances? I was honoured to assist the temple priest in performing the abishekam. By Lord Skanda's will only would this be possible. Else in other temples, I have witnessed that a second priest is usually on hand to help the main priest. When the puja came, it was a wonderful sight. 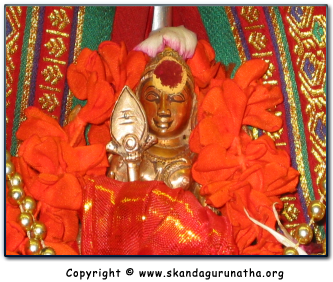 Sri Skanda was decorated with beautiful flower garlands and traditional clothing. I was also bestowed the God-given privilege of singing Pancha Puraanam and Thiruppugal. And as I sang, I also thought about all the dreams and divine experiences of Murugan I have, thus, far been graced with. I was so happy and requested Murugan to bless us all and help us overcome our lower nature. 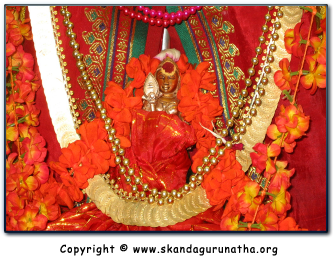 After the puja, Sri Skanda's devotees were fed with uppumaa prasadam. I humbly went and served each and everyone who was there, be it child or adult. Whatever they wanted I gave. I was thrilled to be serving Murugan through His devotees. At last after everyone had been served, I went to eat whatever uppumaa was left over. Unfortunately, all the uppumaa was finished. The last plate I gave was to the priest. Satisfied that all of Murugan's devotees were well fed, I partook of some fruit and started to eat. This was my first meal of the day. My stomach delighted on the panchamritam that was left over. Then suddenly, the priest [Murugan?] got up after speaking with a few devotees and came straight to me and said [in Tamil], "[my name], I have accepted this food with your love. Now please, have some. I have plenty left over and cannot eat all this." I replied [in Tamil], "Aiya, are you sure? I am fine. If you have eaten then I, too, have also eaten." The priest insisted, "[in Tamil] No no. I have plenty to eat. Here you eat." Realizing that this was Sri Murugan's work, I humbly and graciously accepted. As I ate I was overwhemled with joy as I realized how much love Sri Skanda had to not let me go starving. I didn't want to show my emotions to anyone else, so I shed tears of love and gratitude inside myself as my heart felt the intensity of Sri Skanda's love. Then another miracle happened. A devotee [Skanda?] came and said the following words, which really put me in awe of the fact that Sri Skanda knows our every need and He responsibly fulfills them. The devotee said [in Tamil], "[my name], Murugan tells me that you are doing some sort of fast today and has asked me to cook for you! You wait here and I will make something quickly for you." Upon hearing these words, I was shocked beyond belief. I replied [in Tamil], "Siva-anna, who told you that I was fasting?" Siva-anna replied [in Tamil], "Murugan! Who else? He tells me from within that you are not to leave this Temple without eating some food!" "But, I am full. I ate all this fruit. Thank you. Please don't trouble yourself." I responded. "[my name]! Listen. This is my duty to see that whoeverso fasts out of love for Murugan, must be served." Upon saying those words, Siva-anna did not speak with me again. He was busy cooking and came over to me with the food and I immediately prostrated at His feet. After eating Sri Skanda's delicious cooking (rice and spicy-sambar-like dish with delicious fried vegetables), I lay on the temple floor contemplating over today's events and fell asleep at Bhagavan Skanda's home  this small but powerfully sanctified temple. Thank you dear Lord Murugan - my loving mother. After all the food was given to your devotees, you still did not forget about me and my fast, which I observed for you. O Sri Skanda! I love you sooooo much that words always fail me at moments like this. Thank you for permitting me to feel the light of your love. May you continue you to guide, grace, love, protect, and educate me on the path to your Divine Lotus Feet. May I realize you in this birth and be graced to dedicate this body and its senses to serve you and your devotees. This is my sincerest and honest prayer, which I know you will fulfill.